With 3,500 square feet of floor space and Swedish sound absorbing wall panels our studio is geared to meet your production needs with absolutely no audio obstruction. It is equipped with a 180° white cyc, corner green screen, 12’ video wall and a 17’ full-scale lighting grid that includes individual 20 amp circuits and a Strand Palette OS lighting console. 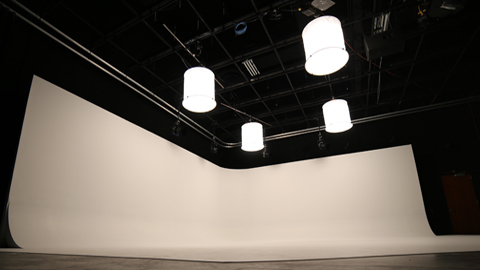 In addition, we have open space to create your own set along with a 180° black cyc curtain, CTV TelePrompter and many more special features available for use. 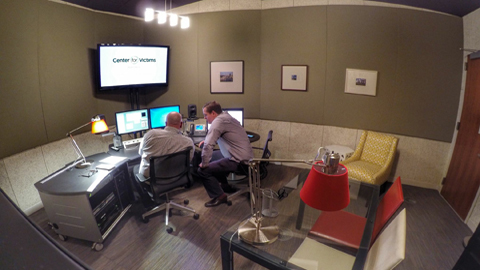 Let us show you an inside look at our studio. This 900 square foot set sits under a 17’ lighting grid and is backed by a 180° Infinity Cyc that is pre-lit by four 6K space lights. Designed to give your video production the very polished look that will draw your viewers in, this infinite background provides the fresh, clean and professional image you can expect from Studio 11 Pittsburgh. This set makes a perfect background for photo shoots as well. Need shots of large products or groups? The White Cyc keeps it simple, easy and elegant! At Studio 11 Pittsburgh, we believe the world is our studio and location shooting is our hallmark. From single shots at a location to shooting a cast of hundreds, we will take care of all your on-location needs. Dollies, cranes, Steadicam, aerials … no matter what the production calls for, we’ve got the best in the business on our team. The highly regarded production crew of Studio 11 Pittsburgh is committed to giving you the look and feel of national commercials. If you want it, we will deliver it. 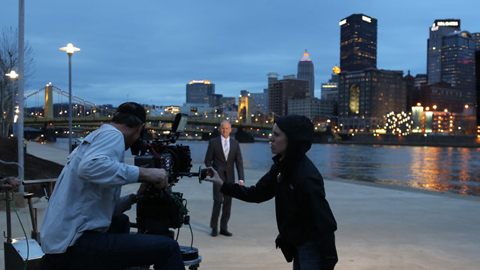 New to the Studio 11 Pittsburgh arsenal is Panasonic’s VariCam 35. 4K capable and HDR Ready, this state-of-the-art camera features a variable frame rate of 1-120fps in 4K and native ISOs of 800 and 5000. The excellence of this unit is matched by the lenses we have chosen to pair it with. Studio 11 Pittsburgh is one of the only production facilities on the East Coast to own a set of exclusive Arri/Zeiss Ultra Prime Lenses. 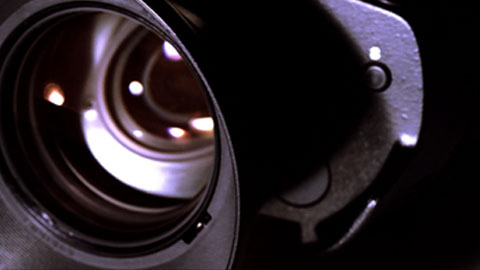 This combination is recognized worldwide as the industry’s premier digital cinematography camera package. Studio 11 Pittsburgh is also equipped with the Panasonic AJ-HPX3700. This workhorse VariCam HD camera produces uncompromising cinematic image quality. Editing is format flexible and fast, thanks to Avid editing software combined with the Avid Nitris DX hardware (using AVC-Intra acceleration). Collaboration with our community of artists, writers and editors is unparalleled using the Interplay Access database. Studio 11 Pittsburgh’s Adobe Suite is designed to expand our work into the 4K environment generated through our VariCam 35 Camera Package. Our expertise with these tools allows us to complete your HD edit on time and to your specifications. Graphics play an integral role in developing your company’s identity and creating brand equity. It is through deliberate and conscientious design that your company’s message gets maximum impact. 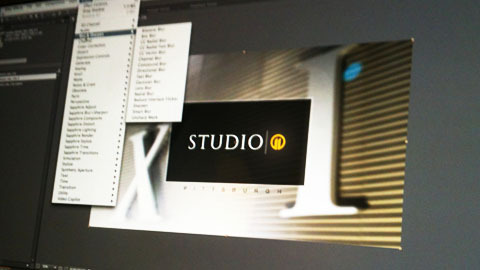 At Studio 11 Pittsburgh’s Graphics Department, we have over 100 years of combined experience. Our team of graphic and broadcast designers have the knowledge and collaborative resources to maximize the impact of your marketing strategies. Bringing your ideas to fruition, while keeping in mind your target audience, we can help your company reach its tangible goals through the power of great design. Let us help you get animated. © 2019, Studio 11. All Rights Reserved.